If you want to step up to an American Made Tape, use our Intertape Premium Packing Tapes. Coated with an aggressive Acrylic adhesive -great for recycled corrugated and suited for all temperatures. Tired of your tape popping off- Go American! Looking to use a carton sealing tape on recycled cartons? Then we can recommend a shift from Acrylic adhesive to a Solvent baed packing tape. Solvent adhesivesSticks to most surfaces and is super aggressive. If you need a Natural Rubber Adhesive Packing Tape, good for real cold rooms; something that is made especially for recycled corrugated and that sticks to laminated corrugated cardboard in cold temperature applications: then you need our Natural Rubber Adhesive Carton Sealing Tape. 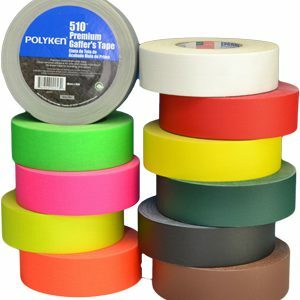 It’s the Industry standard for Screen Printers Tape.